Grizzlor – The Legend Comes Alive! 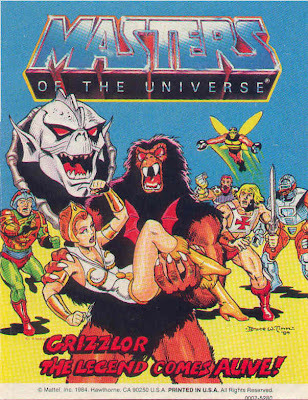 Is a 1984 Masters of the Universe mini-comic. No author is credited; it’s illustrated by Bruce Timm, who’s best known for designing the DC Animated Universe. Here, Buzz-Off tells the Heroic Warriors a campfire story about the mythical Grizzlor; Hordak then sends Grizzlor to kidnap Teela. Wow, the Evil Horde already. One tends to forget that there was a pre-She-Ra Horde with a distinctly different backstory from the Filmation spin-off. And Grizzlor himself is a pretty cool villain here – he’s like a werewolf with a gun, and he can actually speak in complete sentences. The story itself is middling at best, though. There’s a half-baked boy-who-cried-wolf storyline. There’s the convenient coincidence of the mythical monster turning up the very next day. There’s the exceptionally weak resolution (A mirror? Seriously?). But while the plot turns on Teela getting kidnapped for the one thousandth time, at least Hordak has some logical rationale for it. Timm is easily the best artist we’ve had on these comics who wasn’t named Alfredo Alcala. His action scenes are dynamic and his renditions of the characters, poses, and facial expressions are all strengths. There’s some continuity shenanigans going on with the layouts, though. On page 12, you’ve got all the Heroic Warriors flying in the Wind Raider, then jumping out in cool action poses (presumably leaving the unpiloted Wind Raider to crash dramatically into a mountainside in a giant ball of flame). But on the very next page, He-Man is back at the wheel. Let’s just respond to that with “because He-Man” and move on. One more point on the art. Man-At-Arms doesn’t have his mustache here; that in and of itself isn’t unusual, but, believe it or not, except for maybe the background of one panel where it isn’t colored, it doesn’t appear again in any of the almost two dozen mini-comics that follow, running all the way into 1987. Perhaps it quit over a contractual dispute. Back to business: the long and short of it is, despite some very nice art, this just isn’t a very good comic.